A double DVD, release date August 22, 2006. 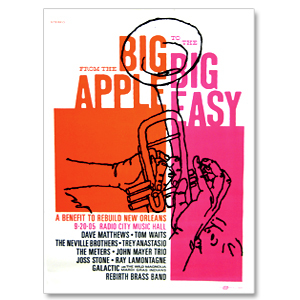 100% of Net Proceeds from the Sale of This DVD to Benefit Victims of Hurricane Katrina. The show in Atlantic City has been cancelled due to illness. The show will be rescheduled and the new date will be announced when it is available. No news yet about the show tonight. Late BEATLE JOHN LENNON�s son SEAN has enlisted the offspring of another rock superstar, PAUL SIMON, to work on his forthcoming album. HARPER SIMON has been helping Sean Lennon record FRIENDLY FIRE, his first album since 1999. An insider says, �Sean and Harper obviously have a lot in common and are good friends. �They know it�s virtually impossible to escape from their fathers� shadows but they�ve had a lot of fun putting the album together.� Friendly Fire is due to be released in September (06). The legendary Abbey Road studios is set to host a new TV series which will feature appearances from some of the world�s top music stars. Twelve episodes of Channel 4�s �Live From Abbey Road� will be broadcast, each show will feature three acts playing three songs each. Acts set to appear on the show include The Who, Massive Attack, Paul Simon, The Killers, Richard Ashcroft and Diana Ross. The show will have no studio audience or presenter with acts bringing their own engineers and given one day to record the sessions. The programmes are expected to be broadcast in November. The make-up date for the Atlantic City NJ concert from July 14 is September 2, 2006 at Borgata Event Center.